We're underway in Rotterdam and Federer got off to a routine start dispatching Grega Zemlja 6-3 6-1 in just 58 minutes to setup a second round tie with Dutchman Thiemo de Bakker. It's the first time Roger has stepped on court since his loss to Murray at the Australian Open back in January so I was obviously expecting a little rust but it turned out to be a very clinical performance. The first few games saw Roger struggle to make his first serve and he had to save two break points at 1-2 in the first set as he slipped to 15-40. Once those were out of the way he never looked back, broke in the next game, followed it up with a love hold and then sealed the set with another break of serve to take it 6-3. After looking like Zemlja might have made a game of it early on Federer just upped his level a touch an that was more than enough to see out the first set without breaking a set. Federer is probably the best front runner in the history of the game so after moving into the lead the result was never in doubt. Zemlja managed to save a break point in the second game of the second set but when he double faulted in his next service game to hand over the break the match was done. 3-1 soon became 4-1 and pretty much in the blink of an eye Roger was shaking Zemlja's hand at the net winning through 6-3 6-1. Cruiserer. In terms of analysis there's nothing to really glean from this match; Roger played well, he clearly likes playing in Rotterdam and I think that definitely bodes well for the rest of the tournament. This one should be another routine match for Roger, De Bakker is a talented player who won Junior Wimbledon in 2006 but since joining the main tour he's not really done much. Roger has played him once before in the Davis Cup on De Bakker's favourite surface of clay; that was a straight sets win for Roger so on an indoor court I think there can only be one winner. I suppose De Bakker will be buoyed by his home crowd but I can't see him being able to do much damage. Look for Roger to win through 6-2 6-3. Allez les Suisse! Did I see a video of Nadal playing Esther Vergeer in Rotterdam?? Did he fly in just for that from South America??? Petty cool if so, she is great champion! Don’t think so! He’s in Sao Paulo withdrawing from doubles matches. @Susie i havent watched the video.But Rafa played Rotterdam in 2009(was runner up)so the video could be from back then. On a side note, it seems Rafa is also complaining about the clay court in São Paulo…:) this guy is just to much, when he doesn’t win e fires in all directions. What the heck is he complaining about now?!? Vasco, ok, so he never plays in South America and now all of a sudden he does and wants to completely renovate the house? He wants the surface to be exactly like in his dreams? Come on! It’s a not so popular tourney where some of the lower ranked players play to make a living. He barges in, can’t win, and starts complaining? How can anyone even like this guy? As for “slippery”, Roger won the “blue” clay Madrid Masters without a fuss. Even big Berdych was ok. The two who really didn’t like it? Dopal and Cvakovic. Why am I not surprised? Hey Vasco, yeah 1 or 2 games of rust, but after that he was dominant. Sid – “so he never plays in South America and now all of a sudden he does and wants to completely renovate the house?” killing me. I’ve not seen whats been said, sometimes you just gotta put up and shut up though. I bet the surface is always like that. He walks on a poor mans clay court dressed like the King of Spain and complains about dust on his robe? Won’t be a pretty picture now, would it? That picture of Fed hitting his BH is cool because you can see the string being hit and impacted. He’s the only one who does that these days. A lot of players’ heads move around at impact. Nice win for Fed today. As far as Nadal….he is whining about all sorts of things. He is complaining about the hard courts and what impact they have on players bodies even after they retire. He said he doubts he will be able to play recreational sports after he retires because of the damage the hard courts have done to his body. He is also complaining about the 25 sec rule when serving. He thinks that is unrealistic. Blah, blah,blah. Maybe he should take up golf before his body completely falls apart! Yeah, he’s been complaining about hard courts since the day he was born. 75% of his Tour titles and 7/11 Slams are on clay. Why would he not gripe about hard courts? What a whiner! He is so getting ready for Paris. He wanted more Clay Masters at the expense of Hard Courts. Why don’t they have a single Masters 1000 on grass? Hasn’t that been such a negative for Roger? I think they should take away a clay masters for fast grass before Wimbledon. Once he wins Paris, the scribes are going to go nuts about how he has once again “recovered” from adversity to win a Slam. Sheeesh, we’re surrounded! Yeah great start, can’t ask for more. Nadal moaning more than usual. His game is the thing that effects his body, not the courts. But who cares? He can play poker right, that’s almost a sport. Sid – agreed, the ATP peRFect Tennis Masters 1000 played on Grass 2 weeks before Wimbledon would work. You have courtside seats already before you ask! Ha! Poker. That’s one place I can totally kick his sorry a**. No joke. Point is, if we consistently had two grass Masters 1000 tourneys all these years, Roger could be sitting on 25 Masters. Nadal fans argue that, well, Clay is his favorite surface but hard courts are for Roger. Wrong! Hard courts are neutral. Roger’s favorite surface is Grass and there are barely any tournaments on that surface. Besides, they extrapolate Dopal’s 1-2 grass record vs. Roger making it look like a 33% success rate. Wrong! If they had met 15 times on grass, starting say 2004, Roger would’ve led 12-3. Do you play Poker Sid? If you ever fancy a NLH Heads Up for Play money or just small stakes let me know and I’ll jump on Pokerstars if you’re on it? Yeah, I do play Poker but in a very disciplined way. Sometimes at with friends but mostly go to a local casino, a $1/$2 ($200 max) no limit table. The highest I’ve played were the $2/$4 tables on FullTilt but haven’t played online in a very long time. Actually, I somehow dislike playing online. Too crazy! Tell you what, I’ll try getting back on Pokerstars for play money and will get in touch with you via hotmail. Cool. I used to play a crazy amount both at the Casino and Online. You play cash then huh, I played that a bit but more a MTT/SNG guy. 18 player turbos were my favourite. I don’t like Turbo. I feel like it takes away the beauty of poker, I mean, it takes the human element out. Ok, well, online doesn’t exactly have a human element (depending on the type of avatar you use – just kidding!) but you get the point I think. It’s too…robotic. I love the Casino. You have to deal with all kinds of people. Some even curse and hurl insults. Rare, but it happens. But I’m disciplines, I know my limits and don’t go too crazy. The pressure you feel sitting at a table can never ever be matched in an online poker room. What do you call Roger when he completely destroys an opponent? Sorry, that was a poor attempt at humor, no? Haha, by your standards? Average I’d say. But you have set the bar quite high really! I couldn’t watch him because tennis tv.com didn’t show the match….why, why, why? Where do you live, Wanda? Hi Natasja, I live in south of France with UK SkyTV but it didn’t show it either. How annoying! I’ve just managed to watch a bad quality highlight on youtube…. I found a stream, had Dutch commentators but was quite good quality. I will email you a link to the site I use. I was able to watch Roger’s match live tonight, though the quality of tennisTV.com was dreadful, maybe due to the bad weather? It was lovely today here in south…. Good win for Fed. Now I’m waiting for your report! See you already found something. If tennistv would be poor again, maybe you can try http://www.nos.nl There is a sports section and if you then click tennis, you’ll find the link to Rotterdam. Hope it works! Great to see the Maestro back in action again. Loved it. He said it himself as well: needed to adjust and that took him a few games. One thing struck me that he said at first, he didn’t see the ball coming perfectly and that took some adjusting too. Tsonga made similar gestures and saying similar things during his match (“I can’t see it properly”) Coincidence? Wondered. The lighting always seems to be perfect I hear in Rotterdam. Will see what happens with Thiemo (or “Tim”, as Fed called him ;)…) He’ll win it, but curious to see if De Bakker has indeed improved his game since September. Let’s just sign up for the scenario that Fed is going to beat up the hometown guy once again… Allez! Yeah, seemed like ages since he last played! Hmm not sure on the sight problem, is it the green background that blends in a little with the ball? 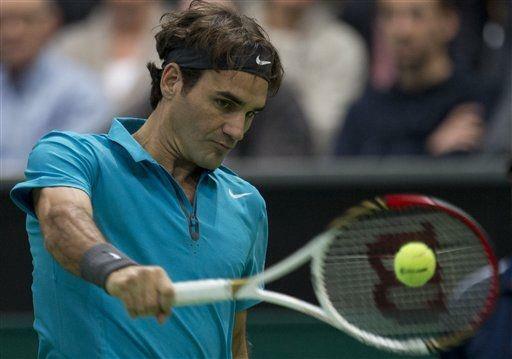 Watching Fed vs De Bakker now, Roger well in control…. Might be that, the green background… Yesterday you could see it being a bit of a problem a few times too apparently (I heard that, missed those few moments) Would be interesting to find out. And yes, Fed in control against De Bakker. It shows his class, again, that he might not have the best night of his life, but still is in control, wins it and plays brilliantly at times. No one like the Maestro. Allez!